Dentures, or false teeth, are dental prosthetic devices made to replace missing teeth. There are two main categories for dentures –partial dentures and complete dentures, and each category has its own different types of dentures. Partial dentures can be removable or fixed whereas complete dentures can be the standard acrylic type, immediate dentures or overdentures, which include implant dentures. An immediate denture is a complete denture or removable partial denture made for placement immediately after the removal of natural teeth. Immediate removable partial dentures are normally made out of acrylic (the pink plastic normally seen on dentures). It is a transitional denture therefore it has no back artificial teeth but only acrylic bite pads. The immediate removable partial denture will be replaced after tooth extraction healing with another partial denture with metal framework. 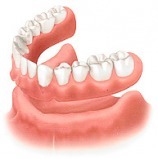 What are the types of immediate dentures? Conventional immediate denture – the denture is intended to be reline (a new layer of acrylic added) to serve as a long-term prosthesis. Interim (or transitional) immediate denture – after the healing of the teeth extraction sites is completed, a second new complete denture is to be made as the long-term prosthesis. Examination, diagnosis and treatment plan is formulated after the condition of your mouth is evaluated. Your informed consent will be asked. Oral hygiene procedures will be performed by the dentist. Usually all the back teeth will be extracted and given four weeks to heal. Impressions of the mouth are taken. Recording of the jaw relationship is done. Artificial teeth are set up and tried in (back teeth only). The front teeth are set up in the models of your mouth. Final extraction of the front teeth and the insertion of the immediate denture. 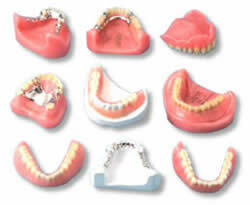 Maintenance of the denture wearer’s appearance as the immediate denture is issued on the same day of teeth extraction. The muscle support around the mouth and the height of the face can be maintained. The tongue will not spread out as a result of tooth loss. Less post-operative pain is likely to be encountered because the tooth extraction sites are protected by the immediate denture. Easier to duplicate (if desired) the natural tooth shape and position. Adaptation to the immediate denture is easier. Speech and chewing ability are rarely affected, and nutrition intake can be maintained as you do not need to wait until your standard dentures are ready to have solid foods. The denture wearer’s psychological and social well-being is preserved as your immediate dentures are in place after the extraction of the natural teeth. Immediate dentures are more challenging to make for the dentist as errors can be easily made during the immediate dentures procedure due to the presence of remaining natural teeth. No denture try-in for the front teeth is available so you do not know how the denture will actually look like on the day of insertion. More chair time and additional appointments needed. 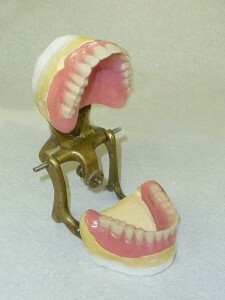 The immediate dentures do not fit as well as normal complete dentures. Immediate dentures can cause sore spots in the mouth which can make the first week or two after denture insertion difficult. It will be difficult to speak and eat initially with the immediate dentures. The esthetics may be unpredictable because a denture try-in for the front teeth is not possible. Immediate dentures must be worn for the first 24 hours without being removed by the wearer. If they are removed, they may not be able to be reinserted for three to four days. The dentist will remove them at the 24-hour visit. Immediate dentures will ‘loosen’ during the healing process which will therefore require tissue conditioners to be placed on the dentures. Six to nine months after insertion a reline of the denture need to be done or possibly a remake of the dentures would be required. During the making of a standard denture you will have to bear being toothless until your denture is ready whereas you can get your immediate denture on the same day you extract your teeth if you do not mind the higher dentures cost. Immediate dentures provide the denture wearer with esthetics, function and psychological support after extraction and during healing phase unlike standard dentures whereby you have to wait until your tooth extraction sites to heal before a standard denture can be made.